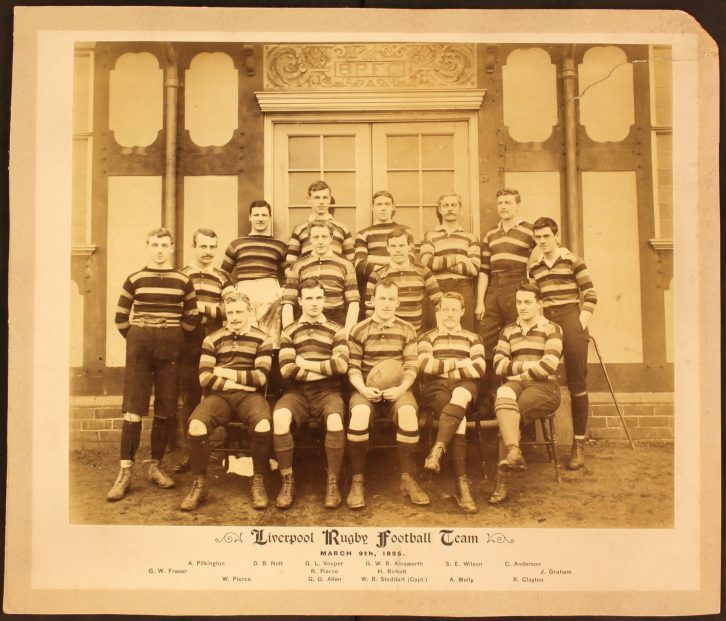 Liverpool FC was founded following an exhibition match in 1857, a full thirty five years before the Association Football Club at Anfield in 1892, making it the world’s oldest ‘open’ rugby club. The club provided three of the England team which played Scotland in the very first rugby union international match at Raeburn, Edinburgh in 1871. Frank Tobin (half back), John Clayton (forward) and Arthur Lyon (full back) were nominated by the club to the England Selection Committee. The team photograph above shows the Liverpool team from the 1894/95 season. The building in the background is the clubhouse for Birkenhead Park Football Club. The initials ‘BPFC’ can be seen above the doors. Traditionally team photographs were taken at the end of the season. Also in this year, 1895, the Northern Union formed. In August 22 clubs met in Huddersfield to discuss ‘broken time payments’ to players who were losing earning through playing rugby on Saturdays. This breached the Rugby Football Union’s strict amateur code. The clubs decided to resign from the RFU and form the Northern Union. In 1922 there was a name change to Rugby Football League, later over time this became known as Rugby League. In 1913, Liverpool FC had a remarkable season, by winning 27 of their 31 matches. This team contained the current Captain of England, Ronnie Poulton, the current Captain of Scotland, Frederick Turner and the current Captain of Ireland, Richard Lloyd. A regular First XV member and distinguished Scottish International at the time not present in the 1913-1914 season photograph was Alex Angus. His CV is included in the pen portraits. St. Helens Old Boys club was formed in 1919 by a group of young men returning home from WWI. They approached Mr. E. A. A. Varnish, Headmaster at Cowley School, for help as he had previously introduced rugby to the school. A meeting was soon scheduled. As the majority of the players were “Old Cowleians”, Mr. Varnish offered the club free use of the ground and pavilion at Cowley Hill Lane. The club then approached Colonel W. N. Pilkington to become Club President for the 1919-1920 season. Colonel Pilkington had played rugby during his time at Cambridge; he was also selected for England in 1898. 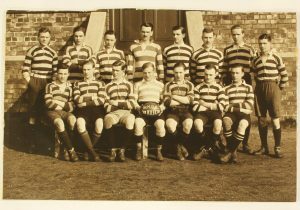 St. Helens Old Boys quickly built a reputation as a talented team throughout the 1920s. However, Cowley School were planning to move to Hard Lane, this meant that St. Helens Old Boys had to find new accommodation. Through the assistance of R. J. M. Wilson, estate manager to the Pilkington family, St. Helens Old Boys were able to acquire the site at Moss Lane, Windle. Club members assisted with donations and Colonel Pilkington gave the club a generous loan to help pay for the pavilion. For the next four seasons until 1935 Colonel Pilkington was also President of the club. Throughout the 1930s the club went from strength to strength, with more players being called up for Lancashire trials. Their first International player was Watkin Thomas, a former Master at Cowley School, who played for Wales. At a General Meeting in November 1932 it was decide to drop the ‘Old Boys’ from the name of the club in a bid to secure more prestigious fixtures with other top Lancashire clubs. The club then became known as St. Helens Rugby Union Football Club.